This warm salmon salad is a wonderful way to transition from warm weather food to cold weather food. 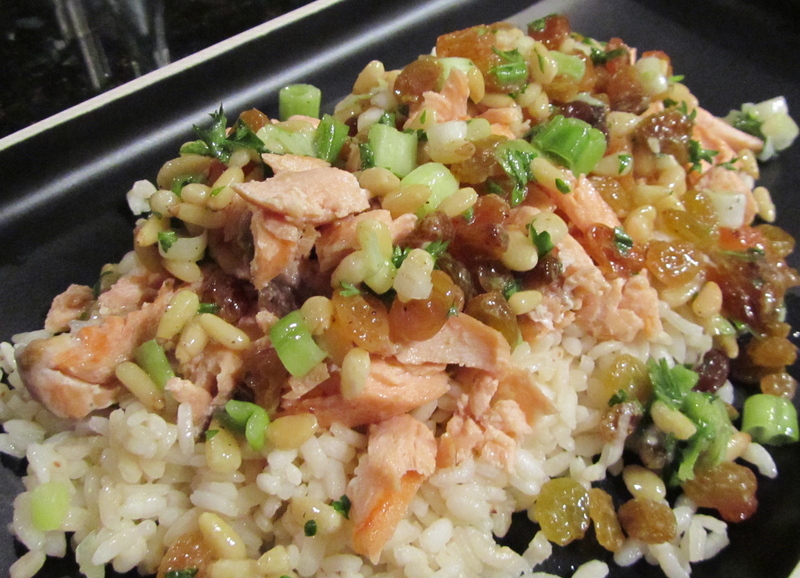 The combination of Arborio rice, salmon, pine nuts, and raisins is over-the-top delicious. Enjoy! 4) Divide cooked rice between 4 plates; top with flaked salmon, and scatter with green onion-pine nut-raisin mixture; serve immediately–we are talking yum! This entry was posted in Entrees, Salads and tagged Cooking, Food, Pine Nuts, Raisin, Recipe, Rice, Rice Salad, Salad, Salmon Pine Nut Raisin Rice Salad, Salmon Rice Salad, Salmon Salad. It took me a long time to appreciate salmon,Now,I find myself experimenting with it more and more.Very nice,Tamara! I’m starting to appreciate it too,Tonette!